Such has been the wonderful success of Die Waffen-SS Alte Kameraden Singen!, the first Veteran Soldatenchor Minden's acapella recording, (ie without any Musikkorps instrumental backing), since we were proudly granted the international rights to re-master and market their original tracks, that Tomahawk Film Music was delighted to have been offered the opportunity to re-master and promote a second studio session that this incredible choir, composed of Nazi Germany's famous Waffen-SS Veteran combat soldiers, also recorded in the early post-war years. 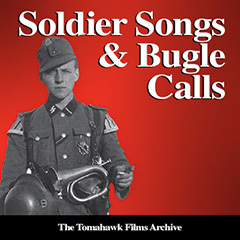 This time entitled: Soldatenlieder und Hornsignale der Waffen-SS, (Soldier Songs and Military Bugle Calls), this remarkable album contains a further 10 stirring and heart-rending tracks including: In Junkers Kneipe - Ganz einsam und verlassen - Soll ich Dir mein Liebchen nennen - Wir lagen vor Madagaskar - Ein Tiroler wollte jagen - Frühmorgens singt die Amsel and an emotional and quite stunning male-voice rendition of Lili Marleen, all sung in the haunting unaccompanied acapella-style by this 50-strong choir drawn from the former ranks of Das Reich, Germania, Der Führer, Totenkopf, Wiking and the SS-Leibstandarte 'Adolf Hitler'. However, totally unique to this second SS-Veteran's production is the inclusion between each song-track of a distinct and very specific bugle called as used by Waffen-SS compnay buglers, both in combat and on the parade ground and performed here by former Waffen-SS Stabshornist Arthur Schulte.